There are many great natural features in the Pacific Northwest. 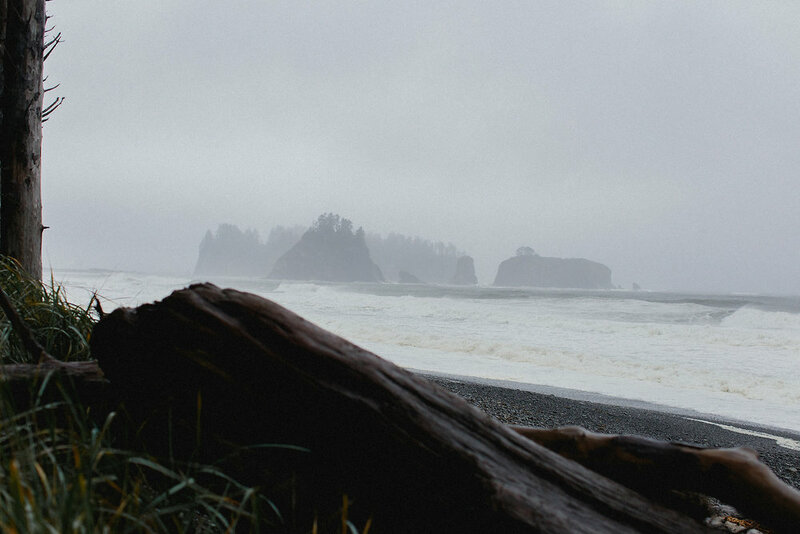 Perhaps one of the most prominent and mysterious is the Olympic Peninsula and the Olympic National Park. Prominent because you can see the Olympic Mountains from nearly everywhere in Western Washington rising high towards the setting sun if you’re in Seattle. Mysterious because even though they are only about 30 miles away from Seattle in distance, because of the Puget Sound it’s a 2.5 hour drive just to get to the eastern edge of the mountains. It’s another 1.5 hours to drive around to the west side where the Pacific Ocean meets the Northwest tip of the 48 contiguous United States. The meeting place of the Pacific Ocean and the Olympic Peninsula at a place called Rialto Beach in the Quileute Native American town of La Push. The beaches here are pebbly and the driftwood is abundant. On this day it was raining and we start it indoors. The Olympic National Park can be very wet. You either accept what life brings you in this case, or be unhappy. Clearly, they chose happiness.